The best pizza in LA? Ask someone where to find the best pizza in LA and the answers are so passionate, so philosophical, so varied you’d think you were asking about the very meaning of life. Pizza purists might say the best pizza can only be found at a pie-only joint that devotes its entire kitchen to the creation of the doughy cheesy stuff. In which case, purist I am not. That’s because it is my strong opinion that some of the best pizza, at least in Los Angeles, is found at restaurants that just so happen to do great ‘za. I’ve had pizza from Santa Monica to Echo Park, Downtown LA to the Valley, but by no means have I tried ’em all. So before you get your mozzarella all rolled up in a ball, keep in mind these are just 5 places where I have found my own version of the best pizza in Los Angeles. When I checked out The Churchill located at the corner of Orlando and West Third I had no idea I’d be encountering one of my new must-have pizzas in LA. In fact, I couldn’t help tweeting and writing about how Stella Rossa has some new competish in town. A wood oven is always a good thing and this laidback gastropub is putting it to great use. While Churchill’s crust isn’t as crisp in the center as Stella Rosa’s, it does have the right amount of chew. To quote myself: Do yourself a favor and order the wild mushroom pizza with lots of enoki and the roasted artichoke pizza. The latter is, like SR’s kale, a revelation. It’s one of those “Why didn’t I think of that?” combinations with baby artichokes, roasted pistachios, burrata, arugula and just a squeeze of lemon. OMG!!!!!! Bubbling bulbs of creamy burrata beckoning for a bite. Crisp blistered edges of slightly dusty dough puffed with pockets of air that just crunch in your mouth. Wild arugula and mushrooms adding the right amount of earthy chewiness. Yes, folks, this is the pizza of my dreams and it too can be yours at Larry’s Venice. It’s OUT OF CONTROL good and I think I may have to go get one right now. (Can you tell I have a thing for pizza with greens and mushrooms?) They have a pie of the day and about about a half dozen other pizzas on the menu–including one with bacon and Brussels sprouts–as well as 26 beers on draft to wash it all down. Forget Gjelina. Larry’s is where to go for high-end (but not high-priced) pizza in Venice. And it’s just a crumb’s throw from the boardwalk and all the sideshows it brings. Located inside the irresistibly chic Avalon Hotel (hint: it’s easy to miss if you’re whizzing along Olympic Boulevard, so look for the tropical foliage on the southwest corner of Olympic and Canon Drive), Oliverio is all about Italian eats with a more modern approach. The last time I visited Oliverio it was at the invitation of chef Mirko Paderno himself, so while I can’t promise he’ll always have the INCREDIBLE life-changing white truffle pizza with its perfectly crispy yet chewy crust on the menu, I can say say he does have the Pizzetta Tartufo e Caprino (black truffle and goat cheese) available for dinner along with a few other options. Black or white, does it really matter? 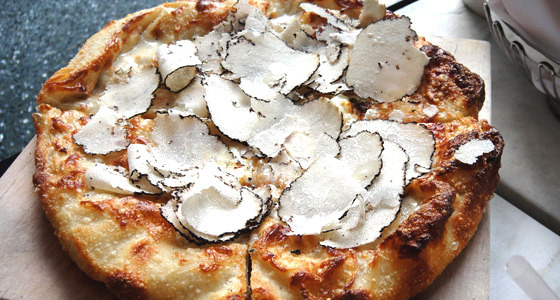 All hail this pricey palace of prized pizza. Hesitant as I’ve been to join the ‘Pizzeria Mozza can do no wrong’ bandwagon, I have to admit that this place does indeed merit much of its praise even though I find the pies to be quite greasy (which isn’t always bad if you’re into that napkin-patting thing). My favorite: The squash blossom pie with its creamy burrata, bright tomato taste and not-so-slightly burnt crust edges. Each of the 20+ different pizzas on the menu sounds more ridiculously delicious than the next–Gorgonzola dolce, fingerling potatoes, radicchio and rosemary? Egg, bacon, Yukon gold potatoes and Bermuda onions? Stinging nettles? Are you kidding me? !–but I’ve only had a few options thus far, including the bianca pizza with crispy sage. And the aforementioned squash blossom, of course. There’s a reason it’s the most expensive pie at $24. Sometimes you get what you pay for. Any places you think should definitely make the list?? Leave your suggestions with a comment below! Have you tried Delancey on Sunset? Its amazing and they have top quality pizzas. I’ve been there a few times n each time surpasses the last. My favorite pizza is the Rivington. It comes with spinach, mozzarella, ricotta, garlic and black pepper. Trust me you wont be disappointed. These are all very good GOURMET pizzas but it mostly sounds like an excuse to charge a lot for some fancy toppings. The best pizza is found at joints that just care about the basics. Sotto. Vito’s Pizza. Olio Pizzeria. MASA EN ECHO PARK IS BEST DEEP DISH PIZZA IN MY BOOK. THIN CRUST = CHILDS PLAY. I’ve eaten the deep-dish pizza at MASA but it’s just too much dough (which gets soggy after a while) and cheese for me – although I know a lot of people love it! ah, sotto! good call — i still have NOT been! Dominos! J/K. I like Vitos in West hollywood.